I have a confession to make. See, lately, I’ve been venturing off to this fantastic, alternate universe… where baby ducks karate chop rattlesnakes, and viral video stars are held captive in the sky, and somehow I find myself rockin’ out to Kenny Loggins. But don’t be alarmed, its all good. 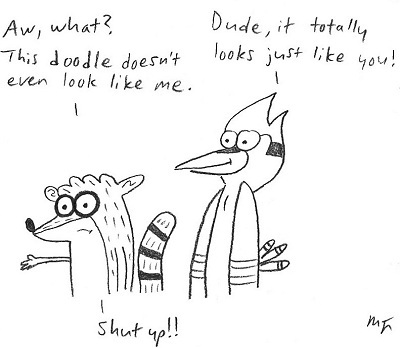 Yeah… I’ve gotten hooked on Regular Show. I’ve obsessed over many a cartoon before. Back in the day, it was I who was mad for Ren and Stimpy. Then, I went totally insaney for Animaniacs. And most recently, I went pure wild animal crazy over Fantastic Mr. Fox. But it’s more of a joy, this kind of obsession. It sneaks up and pounces. I wonder sometimes, where does it come from? How does it find me? Regular Show, as they say, is anything but. It tends to leave me cheering at my TV. It is culturally literate, imaginative, nostalgic, utterly ridiculous, and so, so quotable. It stars one of the all time great animated duos in Mordecai and Rigby, whose genuine if dysfunctional friendship is the kind we wish we all had. The Regular universe is the creation of one JG Quintel, who writes, draws, and voice-acts, and I have no doubt this creator-driven quality is what makes the toon so good. So where does my obsessive joy come in? I think it’s when I start finding this fantasy world and its characters living inside my head, insinuating itself into my daily life. The workday doldrums are so much more bearable, picturing my boss as a gumball machine, and threatening that if I don’t get back to work, I’m SO UNBELIEVEABLY FIRED!!! Ah. Try it. It’s so much fun. From little moments like that, my fixation grows. Soon, all is just right with the world. Obsession, at its best, is a natural high. Like riding a wave of exuberance. A feeling of coming home, when I didn’t even realize I left. My inward buzz can’t help but manifest itself outwardly, and other people take notice. “You sound much more jolly these days!” my friend said to me the other day. What, me, jolly? But it’s true, I am. Truth be told, there are other things in my life making me happy right now. But life just becomes more fun, when I’m obsessed. Still, as personal as my creations are, I share them. Art brings us together, even more so in the digital age. I love being able to touch others with my drawings and words, to invite you into some fantastic inner universe uniquely my own. A word about bronies, if I may. Here’s a community created around a cartoon, that has now crossed over from internet meme to veritable social movement. I work for a children’s charity, and earlier this week, a Brony Society contacted me. They offered to fundraise for us as their community service project, by shoveling sidewalks and collecting donations. I had to smile, and think, “What fine, civic-minded adults, brought together by their obsession over ponies.” I can never diss the Bronies again. They’re good people. I tell you, cartoons… they’re good for us. “A cartoon is a remark made by hand and eye instead of breath… that doesn’t vanish in an instant but remains its original spontaneous self indefinitely… The more you examine it, the better you see its live, black-on-white drawn lines vibrating forever like just-plucked strings.” Not so far fetched, is it, obsessing over a cartoon? So, maybe that’s where my joy comes from. I dunno. Probably best to not to think about it too much. Better to call it magic, and sit back and enjoy. But this much I know: I love escaping inside the universe of Regular Show. Maybe some of you like crawling inside my weird universe too. So go ahead, find your own obsession. It just might do you good. Cause it’s not just the children who need a good bedtime story. Hm! Hm! I have never found myself interested in some of the modern cartoons. I have my passion for the old fashioned looney tunes (before the new, oddly-to-me drawn new looney tunes show) and Tom & Jerry. Ah, but it is still the same excitement. Sharing the obsession is like sharing the love or pain one experiences... you can't hold it in. It hurts if you keep it to yourself. As much as I love my looney tunes, I must say my true obsession lies in video games. Not like Halo or Call of Duty... Once in a blue moon I might take a notion to play it... RPG's... I do have a couple of specific ones to which I feel eternally engaged, so to speak! Indeed. Let us enjoy our obsessions, as long as they don't overtake us. And there are definitely some days where that's easier said than done! Ah, yes, I remember that particular duck. I'm partial to Duckman myself. Ah, Darkwing... it has been too long!